FROM THE MOMENT the Springfield Presbytery expressed its desire to “sink into union with the body of Christ at large,” the plea of Stone-Campbell Christians has always been that there be only one Church with a capital C—one body of Christ. Members shy away from descriptions of their tradition as a sect or denomination (“church” with a small “c”). Instead, they identify as a “movement,” a community of concern and understanding within the larger body of Christians throughout the world. Recognizing that the limitations of human reasoning prevent any Christian’s perfect understanding of all things in Scripture, the movement still puts its shoulder to the great, continuous, unifying task: restoring the church that was in the mind of Christ and the apostles, found in Scripture. While unity and restoration are critical, they cannot be ends in themselves. The movement sees them as means to the end: that the world might know Christ. Thus Stone-Campbell Christians have historically emphasized cross-cultural missions. The movement also offers to the church worldwide a high view of baptism and the Lord’s Supper. These precious, authentic symbols—death, burial, resurrection, participation in the body and blood of Christ, immersion, weekly observance of the Supper—are vital to all Christians. This high view coexists with a belief in the “royal priesthood” of all believers. Any Christian may be called on at any time to preside at the Lord’s table or to baptize the penitent believer. Thus each congregation can prayerfully and freely order its own corporate life. 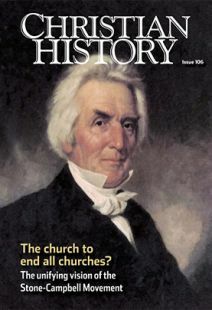 By W. Dennis Helsabeck Jr.
W. Dennis Helsabeck Jr. is associate professor emeritus of history at Milligan College in Tennessee and a coauthor of Renewal for Mission—A Concise History of Christian Churches and Churches of Christ.